01:38 am - Happy Birthday Remus! "Arooooooo" is wrong, Daniel. Concentrate! Today is the birthday of Remus Lupin, the Potterverse's favorite chocoholic werewolf. The above cartoon gave me the giggles when I saw it at Nichtlustig and I thought posting it would be a fun way to celebrate Remus' birthday. 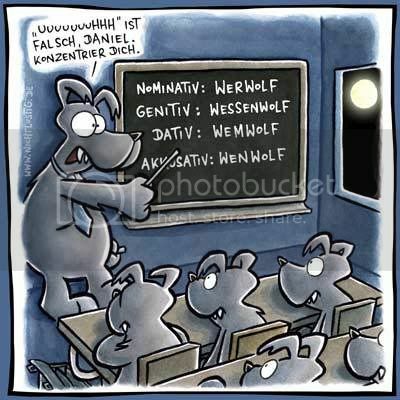 Non-German speakers may need a bit of explanation of the pun, though: what is on the board is the declension of "wer" (the German word for "who") in the four cases of the German language. English really doesn't use cases that much anymore -- the closest we come is using "whom" instead of "who", as in "to whom" and "for whom". Sweeeeet!! Nichtlustig = love! Especially with comics like these on Remus's birthday. was harry potter's birthday August 1? i remember him being a leo. 31st of July as mentioned in all of the books!